St Mirren had to make do with a point against Falkirk despite a last gasp chance to take all three points. Cammy Smith and the visiting support thought they had sealed a win at the Falkirk stadium, but the youngster's effort was brilliantly saved at close range by Robbie Thomson. Saints still lead the Scottish Championship by two points, with Falkirk now down to ninth place. However, Dunfermline's win over Livingston closes the gap at the top. 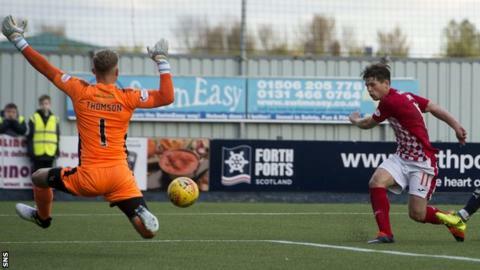 Falkirk should have opened the scoring through Nathan Austin who found himself one-on-one with Saints goalkeeper Craig Samson early in the first half, but he lost composure and hit the side-netting. The home side continued to press and Myles Hippolyte tried to set up Austin again but Samson was quick off his line to gather. St Mirren rallied and Lewis Morgan pushed forward and force an excellent save from Thomson. The Bairns gathered composure and Hippolyte picked out substitute Ciaran Dunne, whose effort was blocked and sent for a corner. Falkirk replacement Kevin O'Hara tried his luck from distance, but shot wide of the target. Then, deep into stoppage time Smith, only a few yards out, tried a shot but Thomson made a spectacular save to make sure the points were shared. Match ends, Falkirk 0, St. Mirren 0. Second Half ends, Falkirk 0, St. Mirren 0. Attempt saved. Cameron Smith (St. Mirren) right footed shot from the centre of the box is saved in the bottom left corner. Joe McKee (Falkirk) wins a free kick in the defensive half. Attempt missed. Cameron Smith (St. Mirren) right footed shot from outside the box is close, but misses to the left. Attempt saved. Jordan Kirkpatrick (St. Mirren) header from the centre of the box is saved in the bottom left corner. Attempt saved. Cieran Dunne (Falkirk) right footed shot from the centre of the box is saved in the centre of the goal. Attempt missed. Kevin O'Hara (Falkirk) right footed shot from the centre of the box is close, but misses to the right. Substitution, Falkirk. Kevin O'Hara replaces James Craigen. Substitution, St. Mirren. Cameron MacPherson replaces Stephen McGinn. Substitution, Falkirk. Lee Miller replaces Nathan Austin. Cieran Dunne (Falkirk) is shown the yellow card for a bad foul. Foul by Cieran Dunne (Falkirk). Attempt missed. Peter Grant (Falkirk) header from the centre of the box is too high. Corner, Falkirk. Conceded by Liam Smith. Attempt blocked. Cieran Dunne (Falkirk) left footed shot from the centre of the box is blocked. Substitution, St. Mirren. Jordan Kirkpatrick replaces Gavin Reilly. Cieran Dunne (Falkirk) wins a free kick on the right wing. Corner, St. Mirren. Conceded by Myles Hippolyte. Attempt missed. Lewis Morgan (St. Mirren) right footed shot from outside the box is just a bit too high. Attempt missed. Myles Hippolyte (Falkirk) left footed shot from outside the box is close, but misses to the left. Attempt missed. Cieran Dunne (Falkirk) left footed shot from outside the box is high and wide to the right. Attempt missed. James Craigen (Falkirk) right footed shot from the centre of the box is too high. Attempt saved. James Craigen (Falkirk) left footed shot from outside the box is saved in the bottom left corner.